NOTICE: Requires the base game Mafia II in order to play. Activation key must be used on a valid Steam account, requires internet connection. ABOUT THE GAMEPlay as Joe in this new add-on content for Mafia II. In this extension to the original story of Mafia II, Joe uncovers who had Vito sent to prison and what really went down with the Clemente family. In addition to the expanded story, players c… an explore new locations and get new cars and clothing in dozens of city-based quests. Plus, online leaderboards allow players to battle for the highest scores.SYSTEM REQUIREMENTS Minimum: OS: Microsoft Windows XP (SP2 or later) / Windows Vista / Windows 7 Processor: Pentium D 3Ghz or AMD Athlon 64 X2 3600+ (Dual core) or higher RAM: 1.5 GB RAM Hard Disk Space: 8GB Video Card: nVidia GeForce 8600 / ATI HD2600 Pro or better Sound Card: 100% DirectX 9.0c compatible sound card Peripherals: Keyboard and mouse or Windows compatible gamepadRecommended: OS: Microsoft Windows XP (SP2 or later) / Windows Vista / Windows 7 Processor: 2.4 GHz Quad Core processor RAM: 2GB Hard Disk Space: 10GB Video Card: nVidia GeForce 9800 GTX / ATI Radeon HD 3870 or better Sound Card: 100% DirectX 9.0c compatible sound card Peripherals: Keyboard and mouse or Windows compatible gamepad Product offered subject to your acceptance of the 2K Games License (see in game manual and at www.take2games.com/eula) and Steam Subscriber Agreement (”SSA”). You must activate this product via the Internet by registering for a Steam account and accepting the SSA. Please see www.steampowered.com/agreement to view the SSA prior to purchase. If you do not agree with the provisions of the 2K Games License or SSA, you should not buy this game in accordance with our returns policy. Non-transferable access to special features such as exclusive, unlockable, downloadable or online content, services, or functions may require single-use serial code, additional fee and/or online account registration (13+). 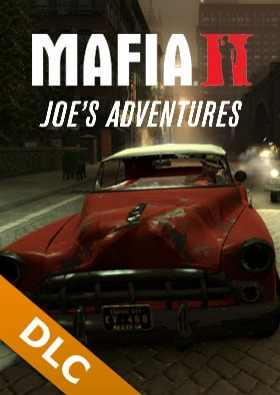 Access to special features may require internet connection, may not be available to all users, and may, upon 30 days notice, be terminated, modified or offered under different terms.Mafia ® © 1998-2010 Take-Two Interactive Software, Inc., and its subsidiaries. Mafia ® II developed by 2K Czech. 2K Czech, 2K Games, Mafia, Mafia II, Take-Two Interactive Software and their respective logos are all trademarks and/or registered trademarks of Take-Two Interactive Software, Inc. The ratings icon is a trademark of the Entertainment Software Association. All other marks are property of their respective owners. All rights reserved.